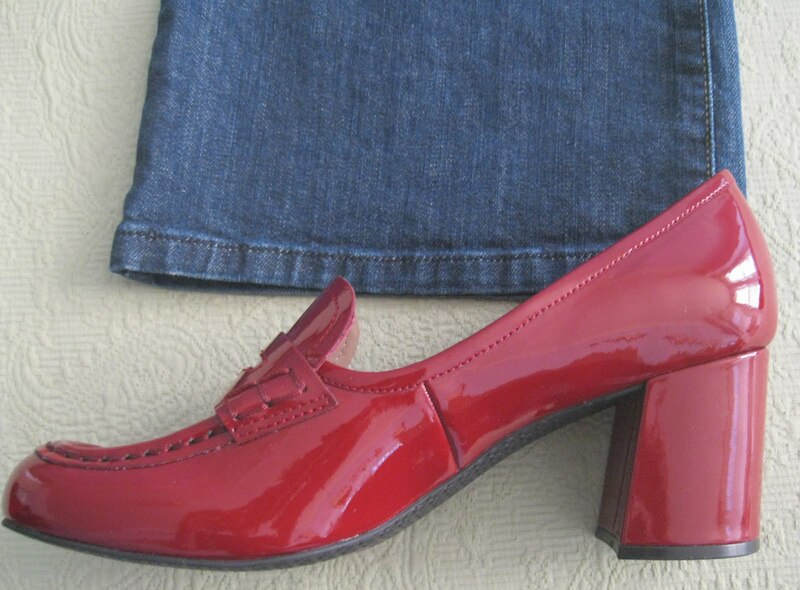 It’s been a long time since I’ve had red shoes but when I saw this pair of red patent penny loafers on a stacked heel by Tahari at DSW last week, I fell instantly in love. It didn’t hurt that they were on clearance. I know red is not the most practical color for shoes but I wear so much black, gray and navy in the fall and winter that I find myself instinctively drawn to deep intense colors in accessories and footwear. These looked fantastic with what I happened to have on in the store—dark denim, long-sleeved navy T-shirt, gray scarf, black peacoat—so I went for it. And then I bought a second pair in black patent. But the red really stole my heart. What about you? Do you own a pair of red shoes? They will go with everything, ahhhhhhhhhhhhh. They have stolen my heart too. I want to see you wearing them, my dear friend. Those are such great shoes! I love them with the Missoni sweater. I bought a pair of red patent sling backs last spring and wore them exactly one time. I am keeping them for now. Maybe I'll wear them more next year. I love these shoes- red is such a practical color- it's a neutral, lol. I have red converse and had a 2 pairs of pumps but realize that I don't wear pumps. Want a pair of red booties and wedges. On the xmas list. Enter my Karina Dress Give-Away! I double dare you to wear those gorgeous shoes with red tights!!! Oh, and I am tickled that you would want to use my pic of the sequins! Use it by all means! Red shoes are great. Seasonless. Patent is great. Since I wear so many dark colors it is great to remember to have a splash of color. Case in point, I am in black and brown today! I just got a pair very similar to these. I tried them on while wearing jeans and they looked great so I had to have them. I have many red shoes in different styles and I just love them. Everything Just Jewelry on Instagram! © 2010-2018, Jill Burgess. Simple theme. Powered by Blogger.